Easter is just around the corner and you know what that means? Jelly beans! Oh man, do I love jelly beans. It’s probably bordering on obsession. If I could have jelly beans for breakfast, lunch and dinner I would! And don’t even get me started on the sneaky and enticing ways Jelly Belly draws you in with their special recipes. But, I’m a grown-up, and I suppose I know better….sometimes. 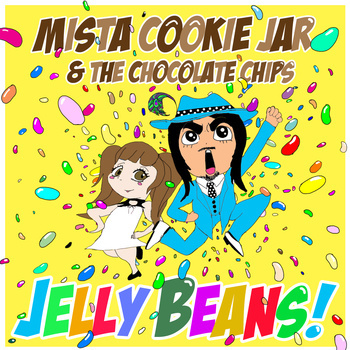 On the other hand, listening to a song about jelly beans is healthy for everyone, which is why I am very pleased to premiere the latest single by Mista Cookie Jar and the Chocolate Chips. Rollin’ in with a candy-bluesy-’lectro-pop ’n’ rock anthem, MCJ and his sensational sidekick Miss Ava Flava save you a trip to the candy store with this delicious, sugar-coated jive for your eardrums. Flavor with a lotta soul. from some candy coated rock ’n’ roll. “Jelly Beans!” can be purchased through the Bandcamp widget below.